Paid Zealotry - Battle Thread. Posted by Ashuancourux. Father Septimus led the group north, as close to his village as he dared. There was a small bridge over the river which could prove to be a concerning choke point, but beyond that lay the village to the north, though they would likely be attacked by the mercenary cavalry on their way there. Despite his fear, Septimus chose to aid the group during the battle, though he was not much of a fighter himself. - Defeat the Astral Monks occupying the Sarynthian Church. - Liberate the Keep by defeating Ragios. Starting positions: Southeast, on the other side of the bridge between the river and the mountain. This message was last edited by the GM at 10:37, Sun 21 May 2017. "Alright, our main objective this mission is to route the Astral Cultists and secure the Church of Sarynth. There are multiple survivors of an attack by the Astral Cultists stuck there, and they won't have much longer to live. We've also been asked to take care of the mercenaries turned bandits, who placed themselves within the castle on the hill. Finally there is a group of said bandits heading for a village, we have to stop them, or at least warn the villagers." Raikos took a moment to let the orders and situation sink in before continuing once more. "At this moment, we are outnumbered, so we will need to be cautious and wary as we move on. Don't rush out by yourselves, and we have to try and take the enemies out little by little. I'll distract the forces to target me, keeping the amount of soldiers heading to the village smaller. Raina, I want you to head towards the village and warn them of the oncoming threat. The rest of you, I want you to assist me in taking down the enemies on this side. Father Septimus, I want you to heal my wounds as they appear, while Raina moves towards the village." "You're Miriam, correct? I apologize for bringing you into the battle so quickly after you have just joined. Though I will be sure to give you a proper welcome once this is all over." Raikos went over to his position on the bridge, on his horse, trying to look intimidating enough that the enemy would come to him, rather than he goes to them. This message was last edited by the GM at 11:43, Sun 07 May 2017. Since the battle had begun, Uriel hopped off Raikos' horse and took up a position behind him, so she would be able to target the enemies that would charge at Raikos with her own potent magics. Leave me alone, or else. Miriam wasn't able to meet Commander Raikos, atleast not yet, as she and Faire were suddenly told to prepare for battle in liberating a church of Sarynth from Astral Cultists. En route, the Panthera made sure that her equipment was ready, changing to a more agile, yet revealing, battle outfit that focuses on ease of movement. She would listen the objectives, and orders, of Commander Raikos while looking towards the far area and barely recognizing a church and castle from afar as well as a nearby village, or town?, surrounded by a bit of forestry. Hearing this person's voice, Miriam would look towards Raikos who was already on top of his steed, who apologized for bringing her in battle as well as offering a proper welcoming after this. The Panthera's ears perked for a moment, before clenched her fists slowly, the sound of metal clinking to one another as the 'claws' met the gauntlets' palm, as she nodded towards Raikos who then went towards the bridge thereafter. ..Won't the bandits gang up on that 'Raina' person easily though? If she slows down one bit, there's no saying whether or not the bandits would do a 'detour' and aim for her either. Regardless of her thoughts, she ought first to 'survive' and test out the very first live battle of being a 'Rune Mage' with her rune-inscribed gauntlets. She'll worry about giving Raikos the letter of introduction after this battle as well. ..Huntress Venovel, please watch over me. ..Those cultists are too resistant to my magic, but the mercenaries and the bandits should be easy prey. However, with how small the area is, I'm worried about not being able to do anything, but orders are orders, I should follow Raikos for now. So far, the approach of the mercenaries had gone largely unnoticed by the enemy forces. The rocks at J16-L16 prevented a line of sight from the monks, and the riders further north had not spotted Raikos crossing the bridge yet. So far, fortune seemed to favor the group. Map updated, Player Phase begins. This message was last edited by the GM at 12:26, Sun 07 May 2017. Raina would listen to what Raikos had to ask, and would give a small nod. Raina knew that it would be dangerous, but she thought this was more useful than anything. Also, that it felt better to protect people in the end. With this,, Raina dashed off on her own horse following up the creek. Trying to stay as far from the view of the mercenaries as possible. Lady Agarwen stepped upon the battlefield, following along with little hesitation. Mercenaries weren't innocent countrymen, defending their families from outsiders; they were combatants by nature--killers, by profession. This was a cause that was in line with her values, though it still meant the taking of life. Gripping the hilt of her sword, she stared out from the cliff face. The battle would soon begin. Her hand trembled for a moment, memories of bloodshed-past boiling to the surface. She steadied herself, and carried on. "Let the will of the Star Weaver be done." Even as an apostate, spurned by the goddess for her bloodshed, the snow elf seemed determined to eradicate the defilers. This message was last edited by the player at 23:08, Mon 08 May 2017. "The enemy has yet to see us, and we'll use this to our advantage. I'll move into the open area near the creek and attract the attention of the cavalry and the clerics. I want you to position yourselves near the cliff side, or if you are unable, somewhere out of sight. When they rush towards me, ambush them and take them out. Uriel, I would like you to help me take point as well if possible. You have a better chance of weathering blows than I. Father Septimus, let the enemy move in and attack me, after I want you to heal my wounds as best as you're able to." With that, Raikos moved his horse off the bridge, and masterfully through the water as he made it to a open section by the river. Raikos would ready his blade and wait, he wanted to see if it would be the same result as last time, or if they would take notice of him and attack. This message was last edited by the player at 03:43, Thu 11 May 2017. ..The cliff side, is it? With the suggestion of Raikos, or was it an order?, the Panthera move towards the cliffside with haste. No other movements after arriving to her location other than staying low to keep out of sight and waiting for Raikos to be noticed where she and the others will potentially ambush the riders. Seeing the group advance, Uriel moved up as well, advancing until she stood next to Myriam. Under most circumstances the order Raikos had given her would have been a silly one to ask of a spelcaster, but she was blessed with the protection of Rakdos, and felt confident that the blades would not be able to touch her. Well, not enough to knock her down, anyway. At the rear of the group, Septimus carefully made his way to the bridge, choosing the position where he would be able to cover as many of his allies as possible. It was clear he was worried about the battle ahead, but the safety of the church spurred him on. The riders spotted Raina, then Raikos as they headed north from the bridge. With a cry of alarm, the riders charged at the group, though their history of oppressing peasants made them overconfident, and their charge was a disorganized one. Blue Rider charged at the mage of the group, but the Pantheran mage managed to dive under the swing just in time (88). Two fast incantations of a Wind Rune were more accurate however (10,81), hitting the rider twice for a total of 10 damage. Mirian gains +2 Tome Use and +10 XPs. Blue Rider has 19/29 HP remaining. Most of the attention was however focused on Raikos, just as he had anticipated. Luck seemed to be on his side however, as both arrows managed to miss him (95, 81). Raikos cannot counter both times, +2 XPs gained. The Monks had noticed something was going on over the ledge, but they didn't care as the mercenaries weren't with them. One of the Priests did move over to heal Blue Rider back to full health. This message was last edited by the GM at 17:11, Thu 11 May 2017. The elf brandished her blade from its sheath, holding it to her side. Sunlight gleamed upon its edge as she ran past her comrades, arrows whistling around her. Her body glided across the ground, her feet gracefully striking the soil with Elven grace. She cast a glance to the side to see that the missiles had missed Raikos, whom was locked into combat a group of mercenaries. She said nothing to him, not even acknowledging his plight with a nod. Focusing her attention back to the battle, she caught sight of a nearby archer riding upon horseback. She rose her blade high into the air and slashed it across the man's exposed leg. The smell of fresh blood spread into the air, though only the tip of her blade had drank of the thick, red stuff. There would surely be more to come. Move to H18. (-5 move; move 1/6). Attack H17 Archer Knight lvl 8 [Iron Bow]. Archer Knight attack speed: Str unknown, cannot assess. Chance for critical: Crit - Target's Luck: 11 - (unknown target luck), cannot assess. Change to hit: Hit – Target’s Avoid: 126-28=98. If 98>roll, success. 22:00, Today: Faire rolled 29 using 1d100 with rolls of 29. Attack with Slim Sword. 9 - 6 - (unknown terrain defense value) = 3 damage. Use of Swords = 0/15 +1 = 1/15. E level. Slim Sword Usage = 30-1 = 29 uses remaining. Leadership bonus: "within three spaces of me [Raikos] you'll gain a 10% bonus to both hit and dodge [avoid]"
This message was last edited by the player at 00:43, Sat 13 May 2017. Finally the mercenaries had rushed towards them, as Raikos had hoped. Though the realization that the Astral Monks didn't fight them as well showed that this was a true stroke of fortune. Though the rouge priest that decided to heal the rider was not. Raikos was wary, and didn't wish to have the monks rush into the fray while he and his group still fought the mercenaries. On that thought, Raikos rushed for the closest Rider blade in hand. "Uriel, Miriam, help me take down this rider." 21:28, Today: Raikos rolled 10 using 1d100 with rolls of 10. Attack with Iron Blade. This message was last edited by the player at 08:07, Fri 12 May 2017. With the battle occurring down below, Raina moved towards the village once more to not only warn the village, but also to see if she could gain some help as well from the village. With the Light of Fjolnir and the Silver Sun masking her movements in their blinding light upon their enemies, Raina was sure that she would safe for the time being. "H-Hello? I'm here with a group to help save you from the oncoming mercenaries and Astral Cultists. I've come to warn you that the mercenaries are on their way and that you should close the village off to protect it." This message was last edited by the player at 08:06, Fri 12 May 2017. Miriam was almost slashed by the sword-wielding rider in front of her and retaliated with two barrage of arrows formed from her wind runes, only for that damage to get healed by one of the cultist healers. Frowning, she heard the words of Raikos and acknowledged it with a slight nod, jumping back behind her before preparing her rune magic. Please guide me, Huntress Venovel! The wind converged around her before streaks of the wind were sent one after the other: the first somewhat catching the rider off-guard and wounding him greatly before the final streak almost ending his life, but a sliver remains sadly however..
17:46, Today: Miriam rolled 35 using 2d100 with rolls of 5,30. Attack with Wind Rune to Blue Sword Knight (x2, 94 to hit). This message was last edited by the player at 11:05, Sun 21 May 2017. With Miriam slaying one of the riders, Uriel was quick to step up before a second rider could fill up the breach in their lines again. Taking a deep breath, she fired a dark bolt at the already injured archer. 20:16, Today: Uriel Marineka rolled 58 using 1d100 with rolls of 58. Uriel vs. Plain Nomad (79 to hit, 3 to crit). Septimus advances a little further again, ensuring he stays safely out of reach from enemy weaponry. Raina, thanks to her Alarym training, quickly manages to cross the water and reached the village. She is quickly approached by several villagers who were watching the battle and, while they don't have the skill or means to help, do manage to bring her some items squirreled away for a rainy day. Hidden Objective cleared: Visit the village. Raina gains +2 Vulneraries (3/3). Blue Rider, still very much alive (if barely), staggers back for healing. Plain Nomad, feeling the brunt of the attacks on him, guides his horse a little back to make room for his more melee oriented buddies and fires an arrow at Faire in retaliation for her blow. 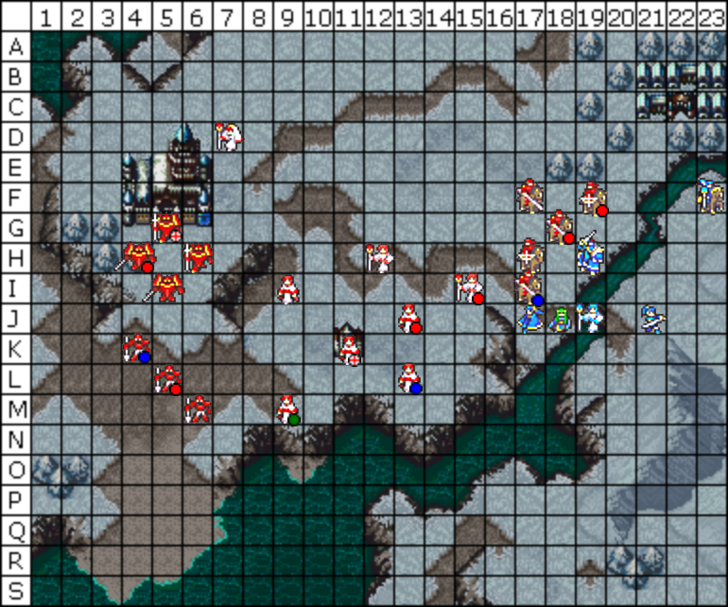 The arrow finds its target (36), hitting the Myrmidon for 8 damage. Faire is hit for 8 damage (20/28 remaining). She cannot counter and gains +1 XPs. Red Nomad decides to get back to a safer position, and targets Faire as well. His arrow finds its mark as well (44), hitting the poor swordswoman for another 8 damage. Faire is hit for 8 damage (12/28 remaining). She cannot counter and gains +1 XPs. Plain Rider repositions himself between the group and the archers. Trying to decide between the wounded Faire and the slow but heavier hitting Uriel, he opts for the latter. His sword easily connects both times (8, 13), hitting for a total of 10 damage. Uriel's bolt does barely manage to miss a chink in his armor, hitting him back for 9 damage. Uriel is hit for 10 damage (19/29 remaining). She gains +10 XPs and +1 Dark Use. Plain Rider has 20/29 HP remaining. With everyone busy moving around, Red Rider simply decides to try and hit the injured Myrmidon directly next to him again. The unfortunate myrmidon is once again struck (55) for yet another 8 damage. Her counter does manage to land, though it does not do much damage. Faire is hit for 8 damage (4/29 HP remaining). She gains +10 XPs and +1 Sword Use. Red Rider has 28/29 HP remaining. Seeing the bleeding mess that is the Blue Rider, Plain Priest moves up to heal him for 18 HP. Blue Rider has 19/29 HP remaining. Red Priest heals Plain Nomad for 18. Plain Nomad has 29/29 HP remaining. The battle was starting to cause commotion among the Astral monks at the church, and some were definitely beginning to pay attention to the group's efforts now, though they did not engage just yet. This message was last edited by the GM at 10:36, Sun 21 May 2017. Raina nods in thanks to the villagers as they gave her the items. Which was more than Rains wanted from them. Taking the time to thank the villagers, Raina hears Raikos call out to her. He wanted her to return and take the chance to heal Faire. She masterfully crosses the water creek to where Faire was. Saying a small prayer Faire's wounds would begin to heal. Than Raina speaks to Farie. "Faire, please fall back for now. Raikos and Uriel will take care of the physical riders. I need you to focus on the mages and healers." This message was last edited by the player at 17:22, Fri 26 May 2017. The arrows cut through her armor with ease, soaking her clothes with her own blood. She felt to her knee in pain, leaning upon her sword to maintain balance. Her gaze started to fade in and out--was this how it would end? At the last second, it seemed, she felt a familiar warmth as Raina's healing magic surged through her body. Her wounds were not completely healed, but it was enough to get her back up onto her feet. In response to Raina's command, she shook her head no. "I would not think to abandon you, milady." With her blade held high, she ran across the field towards the nearby horseman. His horse largely evaded her blow at the last moment, but not before the very tip of her blade could glance across his upper thigh. She braced herself for any counterattacks, breathing heavily. Raina's magic wouldn't always be there to protect her; Lady Agarwen would need to get tougher than this if she was going to survive. Move to G19. (-2 move; move 4/6). Attack G18 Sword Knight lvl 10 [Iron Sword]. Sword Knight attack speed: 11. Change to hit: Hit – Target’s Avoid: 138-29=109. If 109>roll, success. 01:39, Today: Faire rolled 71 using 1d100 with rolls of 71. Attack with Slim Sword. 9 - 8 - (unknown terrain defense value) = 1 damage. Use of Swords = 1/15 +1 = 2/15. E level. Slim Sword Usage = 29-1 = 28 uses remaining. This message was last edited by the player at 05:50, Thu 25 May 2017. "Miriam, move up and attack the injured rider. Uriel, you and I will hold the line to prevent the riders from targeting Miriam, Septimus, and Raina." 10:51, Sat 20 May: Raikos rolled 81 using 1d100 with rolls of 81. Raikos Attack Roll.